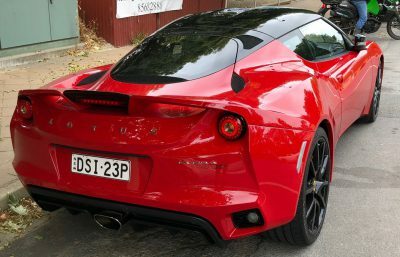 Catch up on all the news in South Australia, including a wrap-up of the March Lotus run and a look towards the upcoming Come & Try Hillclimb and MSCA 6-Hour Regularity Relay in the latest edition of SA Lotus Talk, thanks to our South Australia correspondent Andrew Stevens. Despite competition from the opening of the V8 Supercars and the rechristened Adelaide 500, there was a good turnout for the March run. As 9:00am approached a healthy gathering of Lotus had assembled under the gums trees surrounding the Sikh Centre. There were a couple of surprises in store, with Mark Tiddy debuting his latest acquisition – a very pretty S1 Elise – while another well known local turned up in his gorgeous Evora 400. In addition to the regular smattering of Exiges and Elises, including Charles Hatcher trying out his new hardtop before committing to paint, we had two Lotus 7s, David Baird’s Talbot Lotus (or is that Lotus Talbot), a couple of Evoras and an Esprit in the mix. It was a perfect day for either motor racing (as about 90,000 people who attended the Adelaide 500 will attest), or going for a run in the Adelaide Hills, destination Mt Pleasant on the edge of the Mt Crawford forest and the Eden Valley. The Mt Pleasant Bakery is always welcoming, and the drive up through the hills to this very pretty town just north of the famous Birdwood Mill is always great fun. We’re working with the Sporting Car Club to offer SA Lotus enthusiasts the chance to try Hillclimbing at their “come and try” Hillclimb at Collingrove. This is the easiest and most accessible way to test your driving skills at your own pace, with support from experienced campaigners. Our major motorsport event of the year, Sunday May 6th will see us running one or two teams of Lotus in the Marque Sports Car Association Peter Hall Memorial 6 Hour Regularity Relay (or the ‘6-Hour’ for short) at Mallala. It’s also our monthly SA Lotus run, so maybe the two will coincide at some point in the day. There’s plenty going on in SA at present, with a few new acquisitions, The Bend Motorsport Park opening up, and the combination of Adelaide Hills, autumn weather, and Lotus sports cars to tear you away from the Festival, Fringe, and myriad other events that make up Mad March.